Talley played college football at West Virginia University. Many college programs were pushed away from him, because he played fullback and linebacker at Shaw High School in East Cleveland, never settling on either position. He also missed his last seven high school games with a broken ankle. Talley was a starter from 1979 to 1982 and led the Mountaineers to the Peach Bowl in 1981 and the 1982 Gator Bowl in 1982. Against Pitt, he intercepted Dan Marino to set up a Mountaineer field goal and blocked a punt and returned it for a touchdown. As a senior in 1982, he was selected as West Virginia's third-ever consensus All-American. He started the season off with a win over Oklahoma and was named WVU's season MVP and was named All-American. 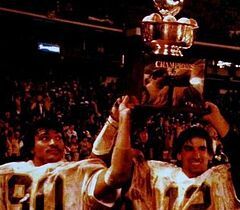 He also played in the 1983 Hula Bowl. Talley's five tackles-for-a-loss against Penn State stand as a single-game record and his personal-best 15 tackles against Boston College won Sports Illustrated Player of the Week honors. For his career, he had 282 unassisted tackles (first all-time), 202 assisted tackles (second), 28 tackles-for-loss (second) and 19 sacks (fourth). During his four-year career, he recorded a school record of 484 career tackles; which has been passed by Grant Wiley. Talley was named to the 2008 College Football Hall of Fame ballot for nominees for induction, and was inducted in 2011 He is also a member of the West Virginia University Sports Hall of Fame. Talley played in the National Football League for 14 seasons and played in four Super Bowls. He never missed a game in his 12-years with the Buffalo Bills. Jim Kelly, the Bills' Hall of Fame quarterback considers Talley his most underrated teammate and believes that Talley should also be enshrined in the Pro Football Hall of Fame. Talley was selected in the second round of the 1983 NFL Draft by the Bills and played in Buffalo for 12 seasons. He is the Bills' all-time leading tackler with 1,137, and also recorded 38.5 sacks, 12 interceptions for 189 return yards and 3 touchdowns, and 14 fumble recoveries for 76 return yards. He averaged 120 tackles, 3.5 sacks and 6.2 takeaways per season and his mark of 188 regular season games played ranks fifth-most in team history. While with the Bills, Talley had multiple nicknames on the field as "The Duke of Awesome", "Spider-Man", and "The Hammer". His cheering section at Rich Stadium was known as the "Talley-Whackers". On November 4, 1990, playing against the Cleveland Browns in his hometown, Talley returned an interception for his first career touchdown. After the season, he received the Ed Block Courage Award. Talley left the Bills to play with the Falcons in the 1995 campaign and then with the Vikings. He left Atlanta on a less than stellar note when it was discovered that he played his last game in Atlanta with a loaded U-Haul truck in the parking lot. He had it so he could go home to spend the holiday with his family once the game was over. He ended his career after the 1996 season and won the Ralph C. Wilson, Jr. Distinguished Service Award in 2000. He now lives in Dallas, Texas with his wife and two kids. Talley is the brother of Cleveland Brown John Talley, and is the cousin of New York Yankee Derek Jeter. On April 25, 2009, it was announced at the Bills Season Ticket Holder Draft Day Party at Ralph Wilson Stadium, that fans had voted 26 members to the Buffalo Bills 50th Anniversary All-Time Team, which was presented by Tops Friendly Markets. The all-star team was composed of the following, including Talley: coach Marv Levy; quarterback Jim Kelly; running back Thurman Thomas; wide receivers Andre Reed, Eric Moulds and James Lofton; tight end Pete Metzelaars; offensive linemen (all guards) Joe DeLamielleure, Kent Hull, Billy Shaw, Ruben Brown and Jim Ritcher; defensive linemen Bruce Smith, Fred Smerlas and Tom Sestak; linebackers Talley, Mike Stratton, Cornelius Bennett and Shane Conlan; cornerbacks Butch Byrd and Nate Odomes; safeties George Saimes and Henry Jones; placekicker Steve Christie, punter Brian Moorman, and gunner (special teams player) Steve Tasker. A 2014 report in The Buffalo News revealed that Talley had suffered brain damage, which Talley suspects stems from his playing days and manifests itself as severe depression. ^ Mark DeVault. "Grant Wiley". WVUStats.com. West Virginia University. Archived from the original on January 16, 2009. Retrieved February 28, 2008. ^ Neumann, Thomas (October 14, 2010). "Jim Kelly talks football, life, wrestling". ESPN Page 2. Retrieved October 18, 2010. ^ "The Month of November in Bills History". Buffalo Bills. Archived from the original on April 13, 2009. Retrieved August 9, 2009. ^ Major, Andy (March 13, 2009). "Kelsay Received Ed Block Courage Award". Buffalo Bills. Archived from the original on April 21, 2009. Retrieved August 9, 2009. ^ Major, Andy (April 25, 2009). "Bills All-Time Team Fan Voting determined 26 Total Members". Buffalo Bills. Archived from the original on April 29, 2009. Retrieved August 9, 2009. ^ Katzowitz, John (November 28, 2014). Bills fans raise more than $30K for former star LB Darryl Talley. CBS Sports. Retrieved November 28, 2014. This page was last edited on 10 April 2019, at 04:32 (UTC).